We have not checked in with our favorite financial blog, Calculated Risk, in a while. We are pleased to see the incredible progress hotels have made in both occupancy and ADR. 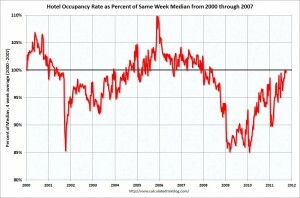 Occupancy has now recovered to the median after falling off a cliff in 2008. REVPAR is now about 3 percent below the median. Check out the full details by clicking on the graph. This entry was posted in News & Notes and tagged hotel occupancy, revpar by TrueGuest. Bookmark the permalink.